Set features a Pick Up Stick tool, a Squeeze N Popper tool and comes with more than 45 cutters and accessories for an all-out creativity fest! Set also includes three 5oz tubs of Play-Doh compound…. This toy costs approximately £9.99 (for the latest and best prices make sure you check our retailer list for the Play-Doh Moulding Mania above). 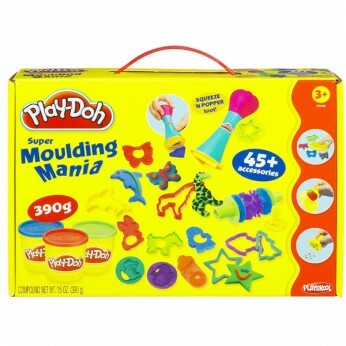 In our review of Play-Doh Moulding Mania we classed it as being suitable for ages 1 to 3 years but recommend you check the manufacturer specific advice before purchasing.